Adelina is a classic, fitted V-neck sweater with a bold stripe of color to give it a modern, figure-flattering edge. The stripe is continued around the hips and (square) neck on the back, but not vertically. The sleeves and hem are done with fairly deep 1×1 rib, there are princess seams for shaping, and there will be both 3/4-length and long sleeve options. Since this was a test knit I made very few changes to the pattern. 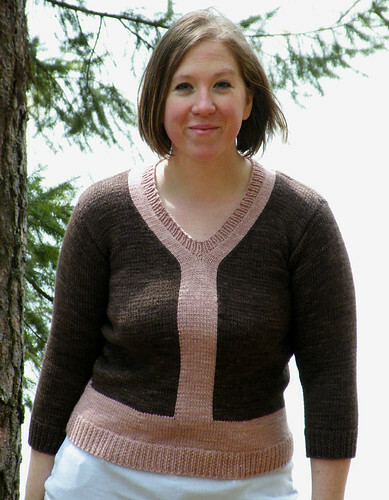 My only modifications were to knit the bottom hem out of the same size needles as the body (all the other rib was done with a needle size smaller), and I changed the gauge to accommodate my yarn choice – I knit a size 32″ to fit a 36″ bust. My version is knitted out of Blue Moon Fiber Arts BFL Sport in Meet Brown, Joe and Rose Quartz. I held two strands together because, although I could get gauge with a single strand, the fabric was lighter than I wanted. If you remember, I was a little worried about the yarn irritating me, but it’s doesn’t. It’s incredibly soft. It is beautiful! It suits you very well. And I love your color choices. Brown and pink, my favorites! Bravo! Beautiful, as is the wearer!!! Beautiful sweater and the colors are very nice. The sweater is gorgeous! I’ll be picking up the pattern when it comes out for sure. You look great, too! Wow, it is gorgeous, love the colours and the shape is great. What a beautiful sweater! I love the pink and brown combo; it’s so warm and lovely. It’s very flattering and pretty! It looks very easy to wear, too. Great job! Cute, cute, cute! I love how the colors give some additional waist definition. I can’t wait for the pattern! It looks great!! !